It's an integrated product that unifies issues, code review, CI and CD into a single UI. GitLab Inc. offers self hosted products and SaaS plans. 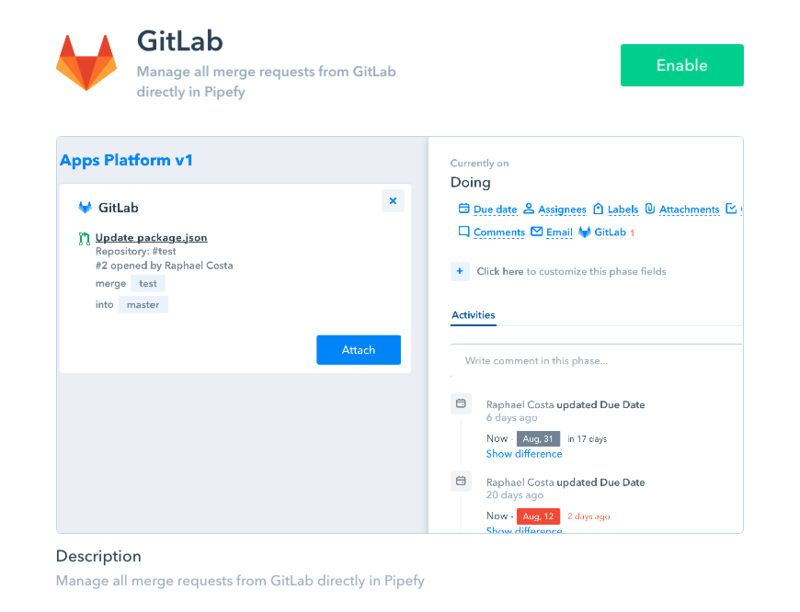 By enabling Pipefy's GitLab pipe app you will no longer need to open GitLab to keep track of your merge requests. 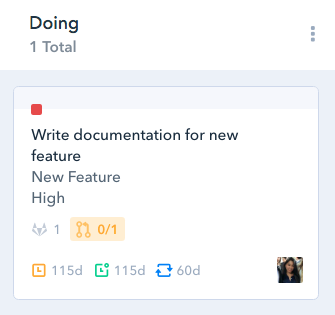 Connect Pipefy to GitLab and attach merge requests to your cards to keep track of them, easily checking the cards to find out whether your requests have been merged. How to enable the GitLab app? Once you click on it, the GitLab app tab will open on the left side of the card. When you click on "attach" for the first time you'll have to authorize Pipefy to access your GitLab account. Click on "Authorize GitLab account" to open a box where you'll choose to authorize Pipefy to access the data in your GitLab.com projects or the settings if you're using the self-hosted version of GitLab. 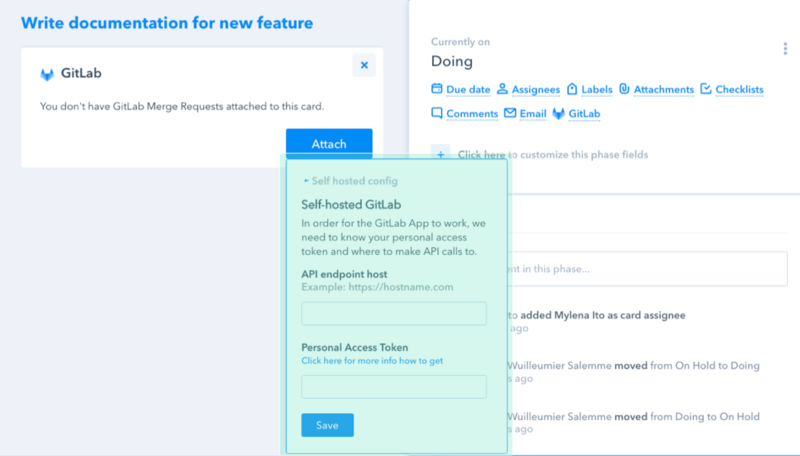 If you're using the self-hosted GitLab you'll need to enter your API endpoint host and your Personal access token. You'll see the merge request's name, its project, its number, labels (if applicable) and the name of the person that opened it, as well as the branches it'll be merged from and to. You can attach multiple merge requests from multiple projects to a card. Each time you click on attach, Pipefy will ask you to pick the project and merge request. When you click on the merge request within the card you'll be redirected to GitLab. You'll also be able to see in the closed cards how many merge requests are attached to this card and how many have been merged. If the icon is green it means all requests have been merged. If it's yellow it means that at least one of the attached merge requests haven't been merged yet. The merge requests' status is automatically updated every minute so you can be sure the information displayed in your cards is always up to date. To disable this app, simply open the sidebar menu > apps > GitLab and click on 'disable'.